So, say you like your morning espresso (yum!). :) But that little tiny backpacking espresso maker just falls between the pot supports on your stove. :( What to do? Well, let's take the example of the MSR Whisperlite. With a Whisperlite, it's really no problem if you've got an MSR Espresso Star. Just lay the Espresso Star across your pot supports, and you're good to go. Of course, there are other stoves besides a Whisperlite that have pot supports that might be a bit wide for a little espresso maker. So, I thought I'd try it on another stove. Here's the MSR Espresso Star on a Primus Omnifuel. Obviously, I haven't exhaustively checked every possible stove out there, but if you've got a three legged stove where the legs are evenly spaced (120 degree angles), radiating outward from a central point, then the MSR Espresso Star will most likely work. Now the bad news: These are now available second hand only (eBay, Craig's List, etc). The MSR Espresso Star is a nifty little gadget, but apparently it didn't sell well enough to be retained in MSR's product line up. Having struggled with jury rigging an espresso maker on my winter stove, I was delighted to find one on Craig's List. Search, and you might be able to pick one up too. The titanium version of the JetBoil Sol might have an occasional* problem. The problem appears to be fairly limited, and many people have used the titanium version of the JetBoil Sol without problems and are completely satisfied with the product. Please note that my concerns pertain to the titanium version of the JetBoil Sol only. There have been a few failures noted in the aluminum "flux ring" (heat exchanger) that is joined to the bottom of the titanium pot. Typically (I'll get to the more extreme cases in a minute), what appears to be happening is that someone is heating something other than just water in their JetBoil. Heat builds up in the aluminum heat exchanger, more heat than the heat exchanger can handle, and the heat exchanger becomes damaged. The damage typically appears to be a melting of the heat exchanger. It's possible that the aluminum could be undergoing combustion. 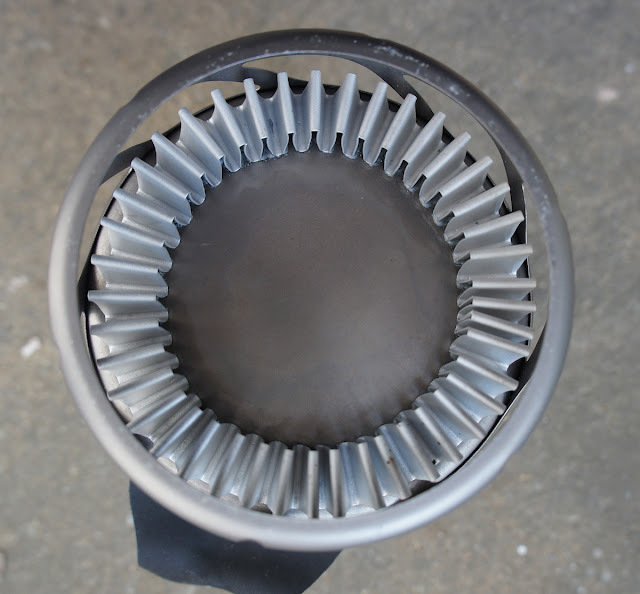 Whether melting or combustion, the heat exchanger is damaged. 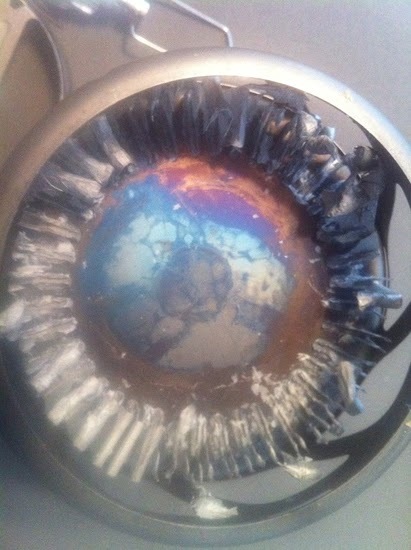 A damaged aluminum "flux ring" (heat exchanger) on a titanium JetBoil Sol. Photo courtesy of John Abela of HikeLighter.com. Used by permission. So, caution number one: If you screw up while cooking with the titanium version of the JetBoil Sol, you might really damage your heat exchanger. What are some ways to minimize the risk of damaging the heat exchanger? 1. Only boil water. Water typically does not exceed 212F/100C in temperature. Yes, salts and minerals in the water may raise the boiling point a bit, but it will still be somewhere near the typical boiling point. Water makes a very effective way of putting an upper bound on the amount of heat the pot and heat exchanger is subjected to. 2. Moderate your flame. Yes, I know, you bought your JetBoil because it's faster than a speeding bullet, but really, will a moderate flame make that much difference? What, 30 seconds more? How much is an undamaged heat exchanger worth? A few more seconds wait is well worth it if you save your heat exchanger. The titanium version of the JetBoil Sol isn't cheap, now is it? So slow it down a bit, yes? 3. If you do heat up something that's a bit more than water, stir it continuously. If you burn something to the bottom of the pot, it could form an insulating layer. That insulating layer will act as a barrier and not allow heat to be transferred from the exchanger into contents of the pot. You do NOT want anything to block the normal heat transfer. If the heat builds up in the fairly thin aluminum of the heat exchanger, that's when damage is most likely to occur. 4. Don't heat up something with a low moisture content. 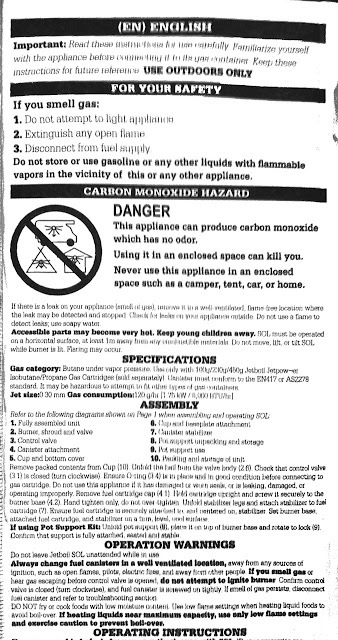 The JetBoil's instructions (see appendices, below) state as much. Personally, I wouldn't heat up anything thicker than the slurry formed by adding water to a freeze dried meal, but whatever you heat up, make sure it has a lot of water content. Now, for the above, I said "typical case." By that I mean typical case where there has been some type of problem. Of course 99+ percent of the time there is no problem. A typical heat exchanger on a JetBoil Sol Ti (perfectly normal). Photo courtesy of Martin Rye of Summit and Valley Lightweight Backpacking. Used by permission. Beyond the typical problem cases as described above, there have been a few, very few, cases where something more unusual happens. What happened? Well, we can't tell exactly from this video, but we do know that aluminum and titanium are rather dissimilar metals. The rates of expansion and contraction during heating and cooling between the two metals are quite different. Every time you heat or cool the two metals, the two metals will be pulling on whatever joins them, presumably a weld in this case. Given that the above happened in cold weather, the two metals may have been put through quite a temperature range, causing the weld to separate. I'm speculating of course, and this is the only reported case I've seen of this type, so I wouldn't read too much into it. 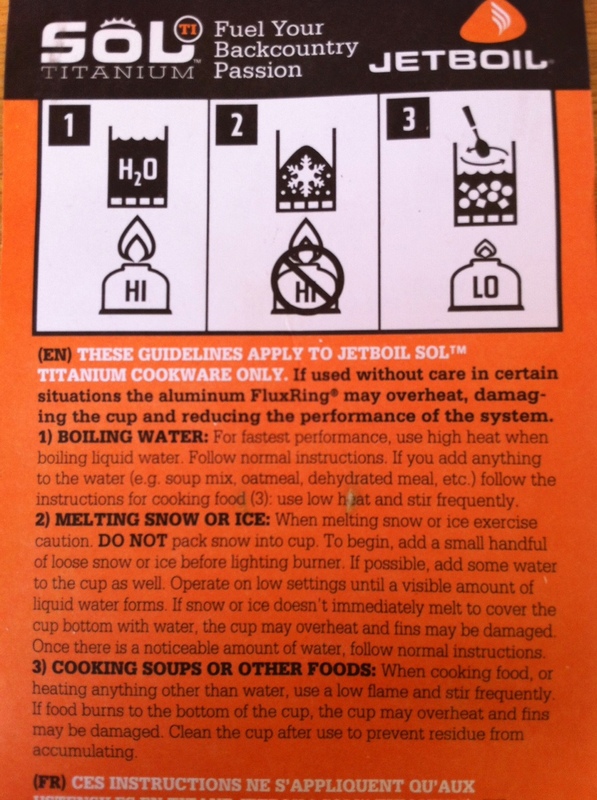 However, neither would I plunge a hot titanium JetBoil Sol into an ice bath. So, caution two: Rapid swings in temperature might cause problems with the heat exchanger. Taking steps to moderate the rate of temperature increases and decreases is only prudent. Now, one last case, and this one a bit more troubling. But, while troubling, this is only one case out of the presumably thousands of titanium JetBoil Sols out there. Let's go back to the JetBoil Sol Ti originally shown in the first photo above. Let me include the original post that I saw on the internet which prompted me to issue my "caution:"
I looked over at my jetboil and all I saw was this massive flame. The flames were probably three feet in the air. I ran over and dumped the last of my water on it (and thus went that night and the next morning w/o water) and when everything cooled down, there was evidences of some serious super heating. The little 'flux rings' ended up super heating and they were just going ballistic. The flux ring material got so hot that it started dripping down onto the ground (which did not go out when my threw my water on it, that stuff was crazy hot) and the drops of super heated metal were all over the canister - which scared me the most. A few of them actually melted/welded onto the canister of gas. The stupid orange thing was completely melted (I had to take a dremel to cut it off when I got back home - which is where I learned how easy it was to take them off). The bottom of the pot (not the flux, the bottom) as you can see in the photos above suffered major heat damage - and remember, titanium has a melting point of 3034(F). I honestly can't see any heat damage on the titanium pot other than normal "rainbow" discoloration, but if there were three foot flames and temperatures hot enough to melt aluminum, that's very serious, and that kind of heat could potentially cause a canister explosion. What we don't know here is what led to that flame. Did the water boil over onto the canister? If water did boil over, as on all canister stoves, the boiling water could cause the internal pressure within the canister to dramatically increase which might cause a flare which might lead to the kind of flame and damage reported above. Therefore, caution three: As with all canister stoves (this certainly isn't unique to the titanium JetBoil Sol), avoid boil overs. The JetBoil is a very powerful stove. Do not leave the stove unattended. And, yes, I've left various stoves unattended before; we probably all have. Maybe with a stove as powerful as a JetBoil that's not something you want to do. If you saw earlier versions of this post, my earlier caution indicated that you might want to a) hold off on buying a titanium version of the JetBoil Sol until more was known and b) if you've already got one that you might want to set your titanium JetBol Sol aside for a bit, again until more is known. I made those recommendations in light of the potentially serious incident with the three foot flames. With such potentially serious consequences, I felt such a caution was warranted. I see no inordinate danger in the titanium JetBoil Sol at this time. Do, however, see the above three cautions, and heed them. 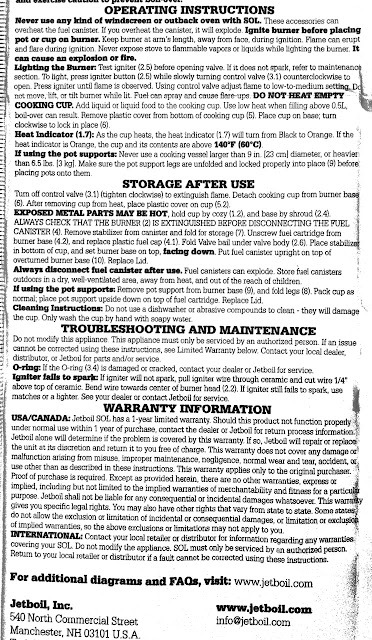 You should also follow the directions provided by JetBoil, excerpts from which are included in the appendices, below. Stoving. Sometimes it's a whole lot more Adventurous than we expect. :) But then that's why you read this blog. I thank you for joining me. P.S. JetBoil, if you're reading this, I would love to have any additional insight or advice that you might be able to provide. You can reach me at hikin dot jim3 at gmail dot com (replace the word "dot" with a "." and the word "at" with an "@"). I would be happy to add your input to my blog. *By "occasional" I mean that very few units seem to have been impacted. I do not mean that all units will occasionally have a problem! Update, 1 Mar 2012: The above linked BPL forum posts have been removed from public viewing. The following are excerpts from the instructions for the JetBoil Sol. All of them appear to be sound advice. Note that they stress how important it is to avoid a boil over. 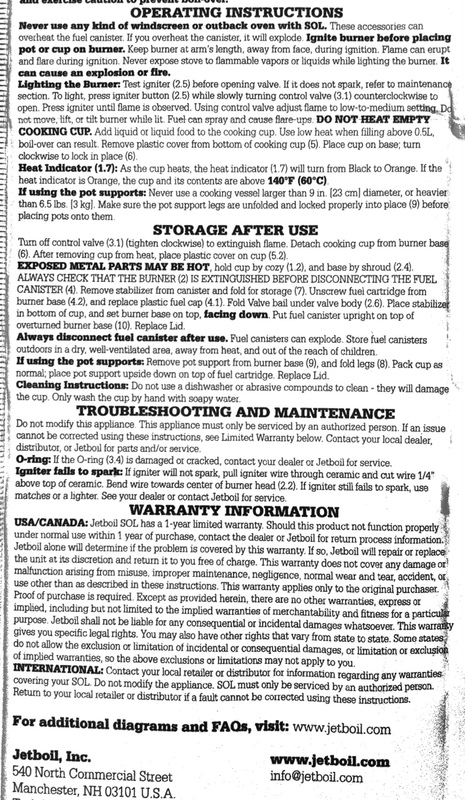 Update 2 Mar 2012: I've added photos of the actual instructions that come with the JetBoil Sol Ti in Appendix IV. Do not leave Jetboil SOL unattended while in use. DO NOT fry or cook foods with low moisture content. Use low flame settings when heating liquid foods to avoid boil over. If heating liquids near maximum capacity, use only low flame settings and exercise caution to prevent boil over. If you overheat the canister, it will explode. Ignite burner before placing pot or cup on burner. DO NOT HEAT EMPTY COOKING CUP. Add liquid or liquid food to the cooking cup. Use low heat when filling above 0.5L, boil over can result. Aluminum melts at 1220.666° F/660.37° C.
I own several JetBoil stoves including the aluminum version of the JetBoil Sol, but I do not own a titanium JetBoil Sol. I am very happy with the JetBoil products I own. I have used JetBoil stoves at altitudes up to and above 11,000 ft/3300m without problems (well, except for the piezoelectric ignition, but that's a known and pretty minor issue). I believe JetBoil is a good company with a good product. In my last post on wood fired cooking, I cooked scrambled eggs and eggs over easy. Well, scrambled eggs aren't exactly the trickiest dish to cook. Don't get me wrong, I was very pleased to be able to cook scrambled eggs so easily on a wood fire. Wood fired cooking on a Ti-Tri Caldera Cone is as easy as pie compared to cooking on an open fire. But I thought I could do more. Well, how about an omelet? And not just any omelet, but a four egg omelet in a fairly small pan. And why might the number of eggs matter? Well, more eggs, means more thickness. To get the eggs to cook evenly all the way through, I'm going to have to have the temperature pretty dialed in. Not so easy, but let's give it a whirl. So, once again, I let the wood burn down to mostly coals. I put in my eggs, a little salmon, and some shredded cheese. How did it go? Actually, it went pretty darned well. A four egg salmon and cheese omelet prepared on a wood-fired Ti-Tri Caldera Cone stove. I was out on a two day back pack here in Henry Coe State Park, so the salmon was canned not fresh, but still, the omelet turned out fairly well. The eggs were cooked but not burnt, the salmon was hot the whole way through, and the cheese was fully melted. Best of all, take a look at the pan I used (far left in the below photo). No sticking or burnt spots occurred when cooking the four egg omelet. No sticking and no burnt spots. Nice! And this was just a little cheap lightweight non-stick aluminum backpacking type pan. No fancy cookware here; just some very basic stuff. If I can properly cook a thick omelet without sticking or burning, then I think there are relatively few restrictions as to what one can cook on a wood-fired Ti-Tri Caldera Cone. The more I use one, the more I like the Ti-Tri Caldera Cone. The Ti-Tri Caldera Cone is fast becoming my #1 favorite stove. For a guy with as many stoves as I've got, that's really saying something. Soto has recently put out the powerful yet quiet Muka gasoline stove (OD-1NP). The Soto Muka stove (OD-1NP) in operation. The Soto Muka is a little bit different than the typical liquid fueled stove in that it does not require priming. I've just recently completed a full review of the Soto Muka which is now available on Seattle Backpackers Magazine. I've also got a video review of the Soto Muka available. This page serves as a supplement to the full review. Herein, I will put up a few additional photos that are worth a look that I just couldn't fit into the magazine review. First, the vari-vent windscreen. This is a really nice windscreen, the nicest windscreen of its type that I've seen. The windscreen is lighter than most in its class, and it has vents that can be opened up or closed down as needed to suit particular conditions. Note: The Muka does need a fair amount of air in order to atomize the fuel properly. You generally don't want to close all the vents all the way. You do want to take care to roll the windscreen (typically around the fuel bottle) rather than fold it. Folding it up will shorten the life of the windscreen. Here, that I've got a 0.9L Primus LiTech kettle on the stove. In this photo, I've tightened down the windscreen and clipped it in place. Soto actually provides a clip -- a much nice clip than the one I'm using here -- that I neglected to use the day I shot these photos. Notice though that there's quite a bit of "excess" windscreen doubled around the pot. They didn't skimp on this windscreen; there's plenty of windscreen to go around a substantially larger pot -- the kind of pot you might use for a group or for snow melting. Another small detail I'd like to call attention to is this fine pored filter on the fuel intake. This is exactly the right place to catch any impurities or adulterants that might be in your fuel. I've seen other companies put filters much further down the line. Nip them in the bud I say: Stop clogs before they start by leaving any crud in the tank. Don't run crud through the pump and down into the stove before you catch it for crying out loud. It's much easier to clean an external filter like the one on the Soto Muka than a fuel filter embedded in a fuel line. Now, here's another thing to notice about the Soto Muka: Look at how small it packs up yet how big that burner head is. Show me another stove in this class that has that large of a burner head and yet packs down this small. That large burner head means you have a well distributed flame. There are no burnt spots from a "pencil torch" flame with a Soto Muka. Even though the Soto Muka packs down small, it has a relatively large burner head with a well dispersed flame. And pack down small it does. Even though the Soto Muka has a relatively long fuel hose, the highly flexible fuel hose packs away very nicely. For those of you who have used stoves with stiff fuel hoses, just take a look at the below photo. Nice! There you have it, a few photos of small yet important details -- details that the designers at Soto did not overlook. Recently, I noticed that the MSR SimmerLite stove was no longer listed on the Cascade Designs/MSR website. Yes, the SimmerLite has been discontinued. Sad to see it go, but it never saw the adoption it needed. It could become a collector’s item in short order, though; I still believe it’s one of the best white gas-only stoves you can get. I echo that feeling. I've always felt that the SimmerLite was a good basic white gas stove. I say "basic" because irrespective of its name, it really doesn't simmer. It's a water boiler/snow melter, but it's not a gourmet cook's stove. I certainly found the SimmerLite to be at least as good as a WhisperLite, but the WhisperLite was of course $20.00 cheaper and had the same functionality. OK, so it's not a gourmet cook's stove. What it was though, was a very lightweight, very packable stove, certainly one of the lightest weight white gas stoves out there. I'm sad to see it go. It's no secret that I like Coleman PowerMax gas canisters. Note: PowerMax canisters are called just plain "Max" in some locations outside the US. First, they're aluminum which means they're quite light. The canister weight (tare weight) of a large 300g PowerMax canister is less than the canister weight of a small 110g standard threaded canister. Second, at least in the US market, PowerMax canisters have the very best cold weather gas mix available (35% propane/65% butane). 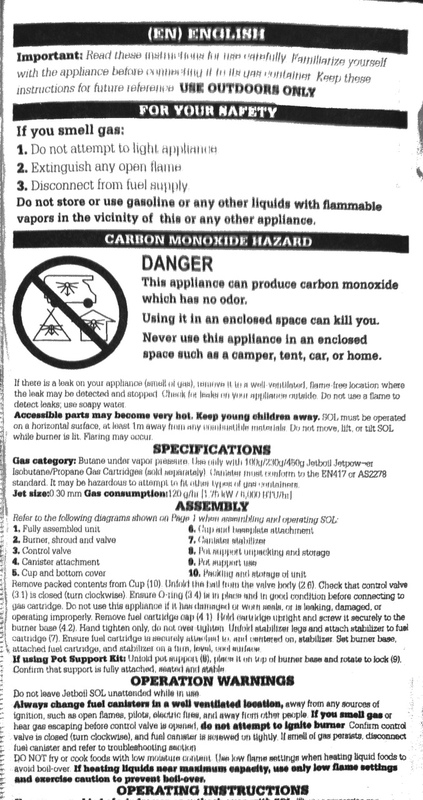 Outside the US, I've seen Max canisters labeled 40% propane/60% butane which is better still. That gas mix when used in liquid feed mode (as designed in other words) can run in temperatures down to -4F/-20C (per Coleman). Unfortunately, PowerMax/Max didn't make it in the market place. Most people either didn't understand the difference or weren't willing to commit to a proprietary, non-standard canister. Much like superior BetaMax lost out to inferior VHS, PowerMax lost out standard threaded canisters. 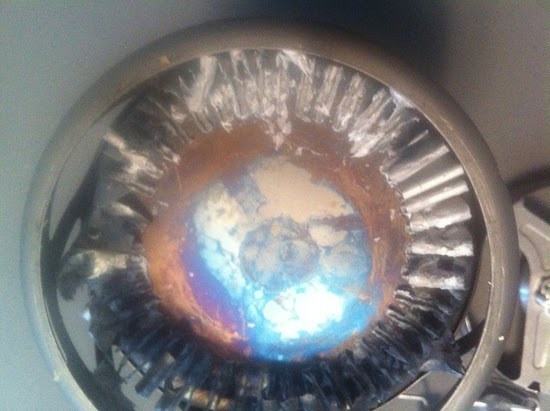 For those of us with PowerMax appliances, what to do? Well, of course you can use an adapter, but that's extra weight, extra bulk, and extra fiddle. Wouldn't it be nice if you could simply refill the PowerMax canisters? Of course it would. But how? Well, I don't have all the answers, but I have a couple of ideas that I thought I'd throw out there and see where they go. First a simple idea. Take a Brunton Fuel Tool or the like (Snow Peak and Primus sell something similar). Attach it by some means to an appropriate fuel source. Then insert the fuel tool into the PowerMax canister. I've had good success with this technique with refilling Rando 360 cartridges. Unfortunately, the aperture on a PowerMax canister is wider than on a Rando 360 cartridge. This technique doesn't work very well with the Brunton Fuel Tool "as is." However, if one were to add some "O" rings and spacers (which I haven't tried yet), I think this technique would work well for refilling. However, this would be a fairly manually intensive technique. The Fuel Tool requires pressure to release the internal valve. In other words, the valve of the Fuel Tool has to be held in place by hand in order to transfer any fuel. With a 100% butane 50g Rando 360 cartridge, this is no big deal. With a 300g PowerMax canister that requires two different component gasses, this could be a bit of a pain in the neck. But perhaps there is another way. Let's take a look at a Coleman "X" stove. They're all fairly similar. In this case, I'll show a Coleman Xpert stove. Now note how the fuel line comes in from the right. A nut affixes the fuel line from the canister to the fuel line of the burner. that one could create an adapter that would affix to the underlying threads. In that way, we could use the connector of the stove itself to attach to a PowerMax canister. This would be a non-destructive use of the components of one's stove. Now there are other candidate ways to connect to a PowerMax canister. 1. A Kovea TKA-9504 type butane adapter affixes to a butane canister via a "cam and fingers" system similar to the way a PowerMax stove connector affixes to a PowerMax canister. But alas the connector on a PowerMax canister is too wide to fit into the adapter's opening. Even if it were to fit, the adapter has no pin with which to depress the Lindal valve of a PowerMax Canister. 2. The base of an MSR SuperFly stove clamps on to the collar of a canister rather than screwing or otherwide attaching to the canister connector itself. The "clamp" does fit on to the collar of a PowerMax canister, but unfortunately, as on a TKA-9504, the PowerMax canister's connector is too wide to fit into the opening of a SuperFly's connector. You can clamp on, but you can't get any gas to flow. A SuperFly stove clamped to a PowerMax canister. Unfortunately the connectors are incompatible and no gas will flow. Neither of the above two candidates for attaching to a PowerMax canister is really suitable. It seems to me that the best connector for a PowerMax canister is the one we already have; the one that came with the stove. I don't have the machinery and tooling to construct an adapter that would connect to the end of a PowerMax stove's fuel line, but I think that's where a good solution to the problem of refilling PowerMax canisters lies. I hope someone with the proper skills and equipment can make use of the idea. Note that PowerMax canisters are NOT designed to be refilled. Refilling a non-refillable canister like a Coleman PowerMax canister in inherently risky. If you refill a PowerMax canister, you are doing something that was never intended to be done to that canister, and you do so at your own risk. I won't try to lay out all of the issues involved, but if you choose to refill non-refillable canisters like a PowerMax canister, you should read up on the issues involved, understand the dangers, and be very methodical and careful. Please note that my surmise that refilling a PowerMax is possible does not mean it's a good idea. There you have it; my thoughts at this juncture on refilling PowerMax canisters. What's one of the most enduring designs of gas stoves? The Hank Roberts mini stove. It's compact design truly makes it a pocket stove. I typically carry mine in a Ziploc sandwich bag, and it really does fit in my shirt pocket. The stove was designed in the late 1960's -- the late 1960's for crying out loud -- but still has a loyal following today. The stove was made by EFI and marketed under a variety of names, the most well known of which were probably the Hank Roberts stove and the Gerry stove. Now, if we were to separate the two halves of the "clamshell" that forms the stove, what might we find inside? Inside the "clamshell" is the burner head and the valve assembly. Cleverly tucked inside is a burner and valve assembly. I've added a couple of napkins to prevent rattling, but the napkins are not strictly necessary. The smaller, longer threaded piece (dark colored) seen above screws into the top half of the clamshell, forming a stand. The bottom half of the clamshell slips over the wider shorter threads (silver colored) to form a windshield/pot stand. The burner then screws in place over the top and holds the wind screen/pot stand in place. A few months ago, I published a blog post on how to use the Hank Roberts stove with an adapter that will allow you to use a modern threaded gas canister. Today, I thought I'd go fully retro and show you how to use one of the original type canisters. A canister of the type used by a Hank Roberts stove. This particular canister is an Optimus 702 canister. The "rosebud" on a canister of the type used by a Hank Roberts stove. The canisters of the type used by a Hank Roberts stove were used by a variety of stoves back in the day. The canister I'm showing here is an Optimus 702 canister which was intended for the Optimus 731 "Mousetrap" stove. These canisters all contained 100% butane. Butane is a fairly easy gas to work with in that it has a fairly moderate vapor pressure. Gasses like propane require much heavier canisters and fittings because propane has a much higher vapor pressure. Of course, the one problem with butane is that butane doesn't work very well in cold weather. Butane vaporizes at 31F/-0.5C (at sea level), which isn't all that cold, particularly for "shoulder season" (early spring, late fall) or winter hikes. Add to that the fact that canisters typically get colder as you use them, and you soon realize that 100% butane typically needs weather above 50F/10C to really work well. 50F/10C? That's pretty limiting. But not the Hank Roberts. You see the canister had a very special feature. The canister when used with a Hank Roberts stove lay on its side. Inside the canister was a wick, a wick that would conduct liquefied butane to the burner. Then the heat of the burner would turn the liquid butane into a vapor which can be burned by the stove. Gas stoves do not work properly when the fuel is still liquid. A gas canister attached to a Hank Roberts stove. Note how the canister lies on its side. Since the fuel is fed in as a liquid, all you really need is just a smidge of vapor pressure to get the liquid to wick into the valve assembly of the stove. Whereas modern vapor feed canisters require that the fuel be at about 10 Fahrenheit degrees above the vaporization point of the fuel (about 5 Celsius degrees) for there to be enough pressure, a Hank Roberts stove can operate when the fuel's temperature is only a few degrees above the vaporization point. And, since the fuel feed is in liquid form, you don't get the same degree of canister chilling that you get with vapor feed. Of course, there's just one itsy bitsy little problem. The burner assembly isn't hot when you first fire up the stove. Since the burner assembly isn't hot, the fuel doesn't get fully vaporized, and your stove will flare until it warms up. A cold Hank Roberts stove flaring on start up. The trick with a Hank Roberts stove is to turn the gas down low at first and let the stove warm up before you turn the gas up. On a cold day, it can take some time for the stove to warm up. One has to be very patient when starting the stove on a cold day. On the day these photos were taken, it was cold and gray, and a hail storm passed through. It was quite chilly, and it took several minutes for the very cold stove to warm up enough to fully vaporize the fuel. But warm up it did, and the yellow flames as seen above quickly settled down to nice well-behaved blue flames. Now, let's back up a minute. Modern canisters are threaded. How do Hank Roberts type canisters work? Well, if you'll recall from the photo where I showed the interior of the clamshell, our burner assembly has a "needle" on it. That needle works much like the needle used to pump air into a basketball, soccer ball, or football. On a ball, the needle is pushed into a "rosebud" like fitting on the ball to be inflated. Once connected, air is transferred from a pump to the ball. On a Hank Roberts stove, the needle is pushed into the "rosebud" on the canister until the rosebud pushes up against the base piece of the needle. When fully inserted, the needle depresses a valve, allowing liquid butane to flow into the stove. Nowdays, canisters typically have valves, but the Hank Roberts type canisters with valves were a real innovation for their day. Well, now that we're all hooked up and warmed up, we'd better put the kettle on to boil now hadn't we? A cup of hot tea on a gray day is just what the doctor ordered! The Hank Roberts Stove is my absolute favorite out of all my old gas stoves. I highly recommend them if you can find one on eBay or a garage sale or something and can find either some old canisters or get an adapter to run the stove on modern canisters. The Hank Roberts Stove: Highly Recommended. I'm not quite ready to review either the Kovea MoonWalker or the new MSR WindPro II (look for my WindPro II review in the next couple of weeks), but I thought I'd let people at least have a look at the two stoves and take a quick look at their relative packability. First the Kovea MoonWalker (also know as the Kovea Camp 4). Second, the MSR WindPro II. Next, I thought I'd try putting a Kovea MoonWalker (Camp 4) into a Snow Peak 1000ml pot. It fits just fine. Of course the real question is can I also fit a canister of gas in there? As it turns out, you can. And how does the MSR WindPro II fit? Well, it fits too although the MoonWalker was just a bit more compact. An MSR WindPro II and a 110g Snow Peak canister in a 1000ml Snow Peak pot. I also tried fitting a 220g canister of gas into the pot -- it didn't work with either stove. Well, that's it for today. Like I say, I'm not quite ready to publish reviews just yet, but look for a review of the WindPro II in a few weeks. Interestingly, the WindPro II as measured on my gram scale at home is just a bit lighter (6g) than the old WindPro.